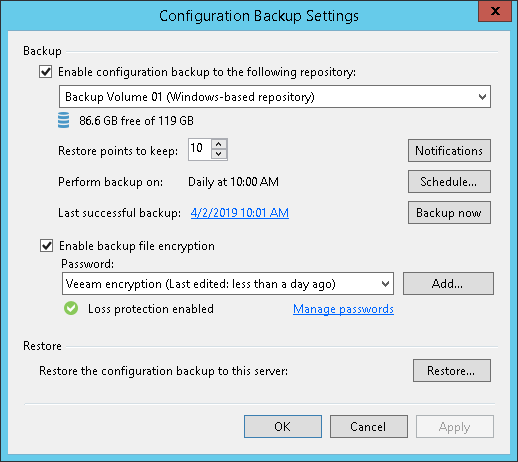 You can instruct Veeam Backup & Replication to perform configuration backup automatically by schedule. If you plan to migrate configuration data to the database used by another backup server, stop all running jobs and disable scheduled jobs before creating the configuration backup. In the opposite case, job sessions may be failing after configuration restore. For more information, see Migrating Configuration Database. From the main menu, select Configuration Backup. Make sure that the Enable configuration backup to the following repository check box is selected. From the Backup repository list, choose a backup repository on which the configuration backup must be stored. In the Restore points to keep field, specify the number of restore points that you want to maintain on the backup repository. Click Schedule next to the Perform backup on field and specify the time schedule according to which the configuration backup must be created. To create an encrypted backup, select the Enable backup file encryption check box. From the Password field, select a password you want to use for encryption. If you have not created a password beforehand, click Add or use the Manage passwords link to specify a new password. For more information, see Creating Encrypted Configuration Backups.